The functions of the endocrine system are intricately connected to the body’s nutrition. This organ system is responsible for regulating appetite, nutrient absorption, nutrient storage, and nutrient usage, in addition to other functions, such as reproduction. 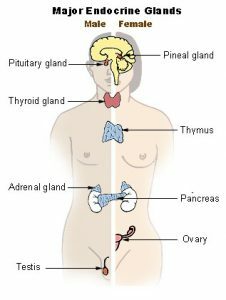 The glands in the endocrine system are the pituitary, thyroid, parathyroid, adrenals, thymus, pineal, pancreas, ovaries, and testes. The glands secrete hormones, which are biological molecules that regulate cellular processes in other target tissues, so they require transportation by the circulatory system. Adequate nutrition is critical for the functioning of all the glands in the endocrine system. A protein deficiency impairs gonadal-hormone release, preventing reproduction. Athletic teenage girls with very little body fat often do not menstruate. Children who are malnourished usually do not produce enough growth hormone and fail to reach normal height for their age group. Probably the most popularized connection between nutrition and the functions of the endocrine system is that unhealthy dietary patterns are linked to obesity and the development of Type 2 diabetes. The Centers for Disease Control and Prevention (CDC) estimates that twenty-six million Americans have Type 2 diabetes as of 2011. This is 8.3 percent of the US population. Counties with the highest incidence of obesity also have the highest incidence of Type 2 diabetes. To see how the rise in obesity in this country is paralleled by the rise in Type 2 diabetes, review this report by the CDC. What is the causal relationship between overnutrition and Type 2 diabetes? The prevailing theory is that the overconsumption of high-fat and high-sugar foods causes changes in muscle, fat, and liver cells that leads to a diminished response from the pancreatic hormone insulin. These cells are called “insulin-resistant.” Insulin is released after a meal and instructs the liver and other tissues to take up glucose and fatty acids that are circulating in the blood. When cells are resistant to insulin they do not take up enough glucose and fatty acids, so glucose and fatty acids remain at high concentrations in the blood. The chronic elevation of glucose and fatty acids in the blood also causes damage to other tissues over time, so that people who have Type 2 diabetes are at increased risk for cardiovascular disease, kidney disease, nerve damage, and eye disease. Do your part to slow the rising tide of obesity and Type 2 diabetes in this country. On the individual level, improve your own family’s diet; at the local community level, support the development of more nutritious school lunch programs; and at the national level, support your nation’s nutrition goals. Visit the CDC Diabetes Public Health Resource website at https://www.cdc.gov/diabetes/. It provides information on education resources, projects, and programs, and spotlights news on diabetes. For helpful information on obesity, visit https://www.cdc.gov/obesity/. The CDC also has workplace web-based resources with the mission of designing work sites that prevent obesity. See https://www.cdc.gov/workplacehealthpromotion/index.html or more details. The Endocrine System by University of Hawai’i at Mānoa Food Science and Human Nutrition Program is licensed under a Creative Commons Attribution-NonCommercial-ShareAlike 4.0 International License, except where otherwise noted.